In May 2013, Alan Connell stepped on to the hallowed turf at Wembley as a substitute for Bradford City as they won the League Two play-off final. Just over two years later, the striker is preparing for pre-season with Southern Premier League Poole Town. It is the place where QPR striker Charlie Austin began his career, but a far cry from Connell's experiences at the national stadium. "When I was at Bradford, I wouldn't have imagined being here, but circumstances have dictated that I am," the 32-year-old told BBC Radio Solent. "A lot of people don't realise there's a life away from football as well." Life as a part-time player will be markedly different from helping Phil Parkinson's Bradford side secure promotion with a 3-0 win against Northampton, and their memorable run to that season's League Cup final, when he scored in their penalty shoot-out win against Arsenal. The decision to join Poole is all about "coming home" and follows an injury-hit spell with National League South club Havant & Waterlooville. "I've sacrificed a lot over the years to benefit my career," said Connell, who will now be facing clubs such as Slough Town, AFC Totton and Chesham United. "Moving around, going to clubs which I think will benefit me at certain times, I just wanted to move somewhere where I feel settled. I'm really excited about the Poole Town challenge. 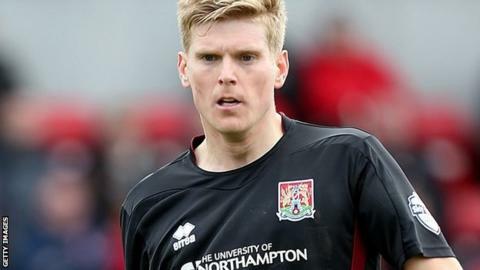 Connell's Bradford spell came to an end in January last year when he left to join a Northampton side in the thick of a relegation battle at the foot of League Two. "Football doesn't stand still for anyone, it's a ruthless game," he said. "We stayed up at Northampton. I didn't personally play well, it was a real dogfight, but we did what we had to do in the circumstances. "At the end of the season, the manager didn't offer me a new contract. I was released and I made the decision to move back down to the south coast. "That's how quickly things can change. "But, I've got no regrets about any decision I've made in my career. I'm sure it's the same for anyone else in any other walk of life, you make a decision at the time you think's right. "You can't look back three years later and say, 'I wish I did that instead'. "I've got a life away from the game now with one or two other things going on and I'm happy again playing my football." Connell's "no regrets" attitude extends towards former managers who have made decisions to let him go - even former Swindon boss Paolo Di Canio, who transfer-listed him after finishing as their top scorer in 2011-12. "I wish all my former clubs well," he explained. "I've got a great relationship with all my ex-managers and when you see these people again, there's a really healthy relationship and a mutual respect." Also among them is a certain Eddie Howe, who began his managerial career within months of Connell joining Bournemouth for a second spell in August 2008. And the striker believes Howe will be more than capable of handling the challenge of managing a team in the Premier League for the first time this season. "If you look at the bottom 10 or 12 teams in that league, I think Bournemouth have a chance of doing really well, not just finishing 17th," he added. "He cares, he has attention to detail, sees things tactically other people don't see. "He's got an aura and respect about him and just demands the best. It doesn't matter who you are, he just demands you're professional. "Anything's possible for Eddie in his managerial career and I think they'll do well this season."